Holy Batmoly! These are gorgeous! Wonderful! Wonderful! Wonderful!!! You're so talented and beautiful Bane! I agree with Natalie! I love seeing you in photos. I've been following you for so long that it's nice to see the creative person behind all those wonderful projects. And yes, you are really pretty! :) Your hair is always so damned perfect. Those velvet skirts are gorgeous! I have a black one also that drags on the floor like a victorian walking skirt. I love how you added the lace at the hem though! Thanks so much! I may go back and add lace to the purple skirt as well. It almost feels unfinished without lace at the hem. You look like an empress in the last picture, very regal and luxurious! Really pretty creations, I might make a velvet skirt with lace as well! 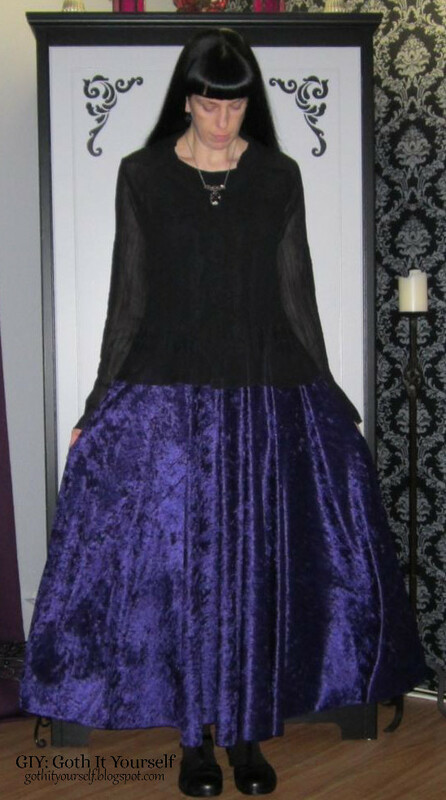 Oh my GOTH those velvet skirts! Curse you, tropical weather, and your non-velvet-friendliness!! Ha ha! Indeed! Of course, colder climates can also be non-velvet-friendly because the buildings are overheated. Very unfair to velvet! You have officially made me miss cold weather... which I never thought would be possible. Heh. Ha ha! I miss cold weather enough for the both of us. ;) Summer just won't let go this year. 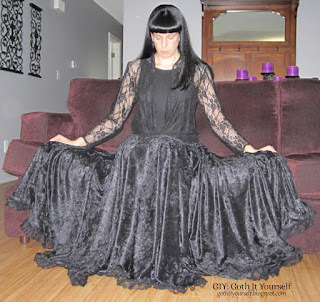 Maybe you can made a petticoat to wear under this skirts. It's very easy, just very time and fabric consuming. I could. These skirts would accommodate a very large petticoat. Long live the long skirt!! Those velvet skirts are absolutely *stunning*! Bane, those long skirts are to die for and you wear them so well!